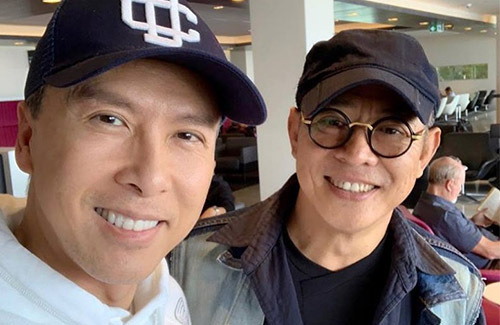 Mulan actors Donnie Yen (甄子丹) and Jet Li (李連傑) have rekindled their bromance while working on the new Disney film. Disney’s live-action remake of their 1998 animated film, Mulan, has recently wrapped up filming in New Zealand. Starring Crystal Liu (劉亦菲) as Mulan, the film also features veteran actors Donnie Yen, Jet Li, as well as Gong Li (鞏俐). Mulan is Jet Li’s first film since 2016’s League of Legends <封神榜>, not including his 2017 guest appearance in Gong Shou Dao <功守道>. Donnie and Jet’s first collaboration was in the 1992 film Once Upon a Time in China II <黃飛鴻之二男兒當自強>, in which Jet played the folk hero Wong Fei-hung and Donnie played the film’s main villain, Nap-lan. They have collaborated in two other films, including 2002’s Hero <英雄> and 2009’s The Founding of a Republic <建國大業>.